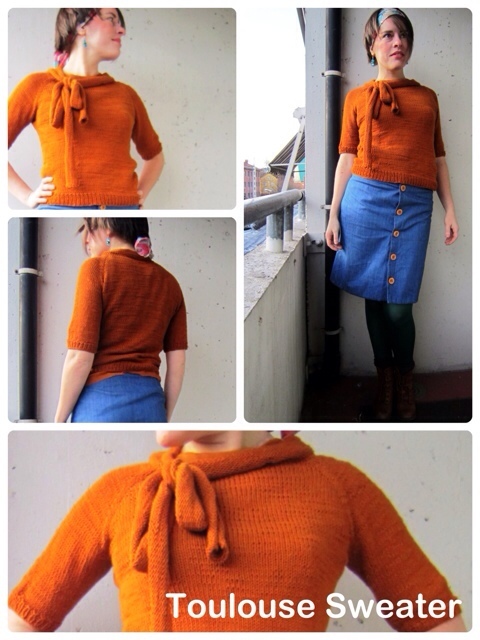 Just a short and sweet post, as I am excited to tell you I finished knitting another sweater! This is the Toulouse Pullover from the Knitscene winter 2012 edition. I fell in love with the style while browsing through my sister's copy of the magazine, so I decided I had to make it. One E-magazine bought on iPad later, and yarn bought specifically for the project, I cast on and knitted a new sweater just in time for spring. I used Dale yarn's Lerke, a 50/50 cotton- wool blend. Love it! The pattern is easy to knit, and easy to adjust as it is knitted top- down. I can truly recommend it! Looks beautiful – well done! Gorgeous jumper! I think having to knit the long ties for the bow would have completely finished me off before I had even started but it looks so beautiful and stylish it would be worth the effort.Cheerful colour too!Well done!! Ooh!!! I’ve seen this elsewhere and yearned after it, even more so seeing yours. It’s such a lovely zesty colour too. This looks so chic on you, and I love how you styled it with the skirt and head scarf. Pretty color, too! Ooo! This is lovely, and the colour is great.